The defending Men’s Open singles champion is expected back this weekend for the 2013 Lyle Pearson Labor Day Tennis Championships presented by Sun Valley Resort Aug. 31-Sept. 2 on the Sun Valley courts. Men’s Open singles winner at Sun Valley Tennis Club last Labor Day was Boise State University tennis player Garrett Patton. 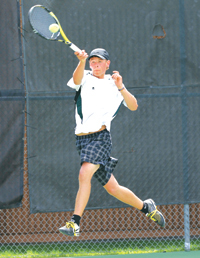 He is a 2011 Boise High graduate and two-time Idaho high school singles king. Garrett is the son of BSU head tennis coach Greg Patton. Garrett Patton, currently a junior on the 2013-14 BSU Bronco tennis team, won by injury default over former Cal Poly San Luis Obispo doubles ace Brett Van Linge of The Valley Club for last year’s title. Van Linge captured the Lyle Pearson 4th of July tennis tournament at Sun Valley, but wasn’t entered in the Labor Day field as of Wednesday. Lyle Pearson tournament director John Perry had 102 players entered in the U.S.T.A. Intermountain competition as of Tuesday, so he extended the entry deadline a few days—for one reason because there had been some concern the tournament wouldn’t be held because of the Beaver Creek Fire. But the annual holiday tournament is full speed ahead, set for Saturday through Monday. Local sponsors include Atkinsons’ and Sun Valley Resort. There is a players’ party Sunday, Sept. 1 at 6 p.m. including a raffle for many prizes. · Also, Brendan McClain, a freshman from Ventura (Ca.) High School; Toby Mitchell, a 5-10 sophomore from Somerset, England; Aidan Reid, a 6-2 redshirt junior form Monument, Colo. and Lewis-Palmer High School; and Thomas Tenreiro, a 6-2 sophomore from Miami, Fla. and Institute of Caracas. They come from a strong program based in Boise. Boise State Head Men's tennis coach Greg Patton was inducted into the Idaho Tennis Association Hall of Fame on May 31, honoring his well decorated career at the collegiate and national levels. Patton boasts a 731-338 career coaching through 32 years as a head coach at the NCAA Division I level and ranks fifth in the nation for most active wins by a Division I coach. He has spent the majority of his career at Boise State—amassing a 380-145 record while winning 10 conference championships and garnering 11 conference “Coach of the Year” honors. He was NCAA “Coach of the Year” in 1997. His Broncos finished the 2013 season with a 20-10 record and qualified for the NCAA Championship after winning the Mountain West Tournament in a thrilling 4-3 final against New Mexico. Andy Bettles, due to play Men’s Open Singles this weekend and Men’s Open Doubles with teammate Brendan McClain, qualified for the 2013 NCAA Singles Championship. For results/draws, this weekend’s tourney site is tennislink.usta.com/Tournaments. Tourney ID number is 250014313. Among the Sun Valley/Wood River players entered in this weekend’s tournament are Amanda Alexander, Nancy Auseklis, Denise DeCoster, Patty Provonsha, Daniel DuFur, Doug DuFur, Paul Exline, John Jacoby, Erin Pfaeffle, Nancy Wasilewski, Peter Samway, Larry Schwartz, Ira Shepard, Judith Steinbock, Raleigh Grossbaum and Wood River High School tennis coach Carlos Meza. Grossbaum, a 2012 State 4A boys’ doubles champion from Hailey’s Wood River High School, is playing Men’s Open Doubles this weekend with Luke Shields of Grand Junction, Colo. This past July 3, former BSU Bronco All-American tennis player Shields was named Boise State tennis associate head coach by Greg Patton. Shields joined the BSU program after spending two years as assistant women's tennis coach at Washington. Shields also coached the Marshall University women as an assistant in 2010-11. As a player, Luke Shields was ranked as high as fifth nationally in singles and fourth in doubles during his career. Shields also excelled in the classroom and was recognized for his exemplary sportsmanship—receiving the USTA Sportsmanship Award in 2007.